How to determine weather you have 48 or 56 frame bracket mount motor. In this reference we will be using bracket mount motors only (pictured below) they are unique in the fact that they have a welded stand or base for mounting purposes, other style motors such as square flange and round face ("C" bracket) are all 56 frame motors. There are a couple of ways to determine what size frame motor you have, you can either look at the motor spec sheet located on the top or side of the motor, or you can measure between the thru bolts. These are the bolts that run the length of the motor and screw into the four legs of the wet-end volute or seal plate. Because all manufacturers do not call everything the same, the best way to determine what you have is by measuring the distance between the thru bolts, this is accurate information for all motor manufacturers. 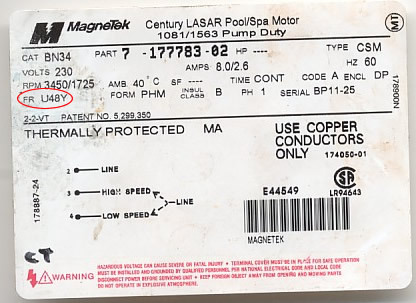 There a four major motor manufactuers Centeury Laser Magnetek, AO Smith, Emerson and General Electric, as you'll see in the examples below the motors all look the same but there frames are listed differently, again the best way to determine the frame size is by measureing the distance between the thru bolts. *Note: Although rare, Aqua Flo FMXP pump wetends used two different 56 frame size motors for their wetends. You can find this important information at the bottom of this help page. Measure the distance between the "Thru Bolts" on the motor that attach to the wet end/pump. Use the references below to find out which one you have. Although motors may be slightly different in appearance, the measurements below are accurate for all 48 and 56 frame bracket motors. Note: "Bracket motors are recognized by the welded bracket stand found on the bottom of the motor. You can also find the frame size of the motor on the spec sheet, that is located on the side or top of the motor. This method can be confusing because some manfactures such as AO Smith and General Electric call their 48 frame motors 56 frame. Again the best way to determine what you have is by measuring the thru bolt distance. * Aqua Flo FMXP 56 frame wet ends, have two different sizes, 4" which was mounted to an Emerson motor and 4-1/8" mounted to a Magnetek motor. Click on the link below to go to the 56 Frame Aqua Flo wet-ends.